This course is approved for renewal of Level 1A/1B OR Level II GASWCC Certification. If you need some clarity when it comes to sediment basin design, installation and maintenance of surface skimmers and baffles, this class will cover everything you need to know! BONUS: A certificate of completion will be provided for each attendee that can be used to fulfill your GSWCC re-certification as well! 1) What types of Surface skimming (Sk) devices can I legally install? 2) How do I connect the skimmer to the outlet of a temporary basin? 3) What kind of baffle designs will work best in various situations? 4) Are there resources available to design and construct one myself so I can save money? 5) Can I use the 5th Edition Greenbook instead of the 6th Edition and not worry about installing a surface skimmer device? Jim Spotts PhD and CPESC, is recognized nationally as an expert on sediment basin design and performance. 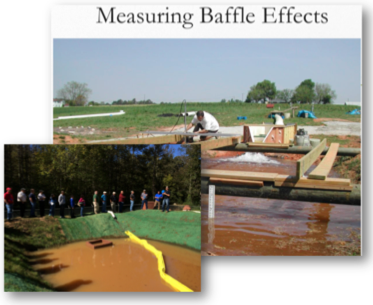 In this 4-hour recertification course (worth 4 PDHs), Jim will present relevant research and practical methods used to design sediment basins, including the installation and maintenance of surface skimmers and baffles. Contractors, Design Professionals, Engineers, Consultants, E&S Installation & Maintenance personnel, Landscape Architects, Equipment operators, etc. · Sediment basins and the control devices (skimmers and baffles) installed for water quality. · New required components of sediment basins, including best practices for design, installation and maintenance. · Criteria to inspect and maintain sediment basin BMPs and components for compliance with project permits.